Sony, the company that invented portable music listening with the original Walkman, this week unveiled the new Walkman NWZ-WS613, a Bluetooth-enabled MP3 player built directly into a pair of headphones. This waterproof Walkman is designed for long workouts and other places where you’d prefer to leave the distraction of a smartphone behind. It holds up to 4GB of music, and can be controlled remotely from a ring-type remote worn on your index finger. If 4GB isn’t enough music, you can connect the Walkman to a smartphone or other personal media player through low-energy Bluetooth. The only downside: It’s a pretty bulky setup to be used as stand-alone Bluetooth headphones. You may get more comfort out of the less expensive LG Tone+ HBS730 ($49.99) or Plantronics BackBeat GO 2 ($79.99) Bluetooth in-ear models. 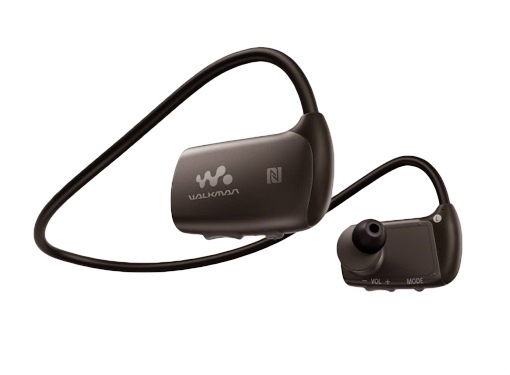 The Sony Walkman NWZ-WS613 will be available this October with a MSRP of $159.99. Doesn’t work underwater using Bluetooth. Otherwise it’s fantastic. We need underwater wireless technology fast!